Friday saw the commencement of the IABA National Senior Boxing Championships at the National Stadium, Dublin. The event is Ireland’s elite amateur boxing competition with over 100 competitors among 18 weight classes represented over both men and women’s competitions. Among these were two members of DCU boxing. Longest serving member Faolan Rahill represented DCU Boxing at Light Heavyweight and Terry Mc Entee at 60kg representing his local club. The two men got their preliminary bouts underway on Saturday morning, with convincing performances. Rahill dispatched Marble City’s Kevin Kehoe decisively, earning a 4-1 decision. After a close first round, Rahill adjusted his game plan and became more aggressive against Kehoe, who was more comfortable fighting at range. After finding a lot of success on the inside Rahill began to establish more dominance and continued to exert pressure. Even more impressive was Terry McEntee in the last fight of the evening making easy work of his opponent, Eoin Meaney, to claim five rounds and progress to the next round. After putting Meaney on the canvas, many were expecting a 10 count but a durable Meaney brought McEntee to a decision. On the back of a 10-week camp and a compelling recent performance in London, Rahill feels he has reached peak fitness leading into the business end of the tournament. Rahill understands the importance of avoiding complacency. He maintains, while looking to stay grounded, he has his sights sets on going all the way. “I’m in it to win it,” he said. “I’m confident I can do it but I’m trying to stay humble. McEntee believes he’s not only representing his local club, but also fighting for DCU Boxing Club simultaneously. He says, “Although my club entered me into the tournament, I feel like I’m boxing for both”. 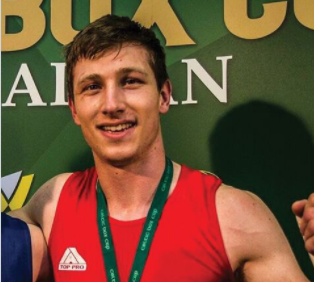 Both men take to the ring again this weekend for the next round of the National Senior Championships with the finals taking place in December.